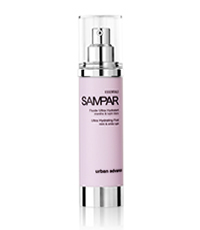 Sampar Ultra Hydrating Fluid softens and repairs dry, sensitive skin and has a long-term moisturizing effect. This light, non-oily fluid strengthens the skin’s natural restructuring mechanisms through the combined action of essential fatty acids, retinol, and proteins from white lupine and sweet almonds. Ultra Hydrating Fluid strengthens the skin’s natural restructuring mechanisms and thickens the stratum corneum. It improves moisturization and reduces water loss by up to 19.5 percent after only 48 hours. This result is achieved because the sweet almond protein forms a protective film on the skin. The Urban Advance Complex works synergistically with the powerful active ingredients to prevent the evaporation of water while acting as a powerful anti-oxidant. This non-oily moisturizer provides long term moisturization, helping to reduce the appearance of lines and wrinkles returning youth and vitality to dull and tired face. The face is fully moisturized, reinforces and protected under all circumstances with this luxurious hydrating moisturizer. Fluid and care-free, its style suits the skin, day in and day out, swathing it in a feeling of infinite well being. This entry was posted in 1 and tagged Fr3b, Free giveaways, free samples, freebies, SAMPAR, SAMPAR Ultra Hydrating Fluid, S’pores 1st Sampling Concept Store, singapore’s 1st online sampling platform, skincare, www.fr3b.com. Bookmark the permalink.